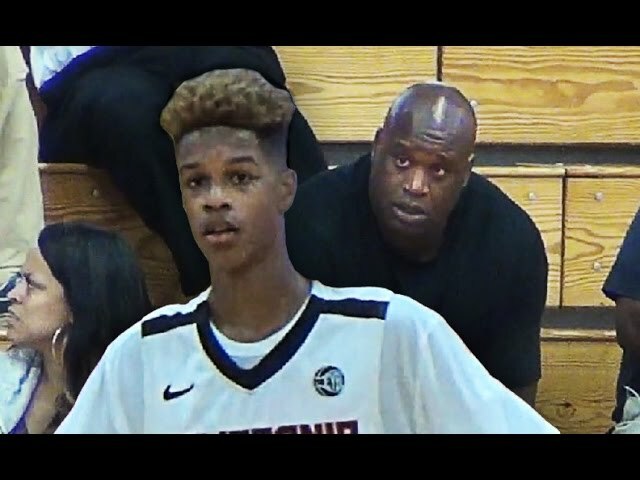 Shareef O'Neal is quickly picking up scholarship offers. The 2018 Los Angeles power forward—and son of basketball royalty—breaks down what he likes about the schools which have already offered him. Entering his sophomore season at Los Angeles Windward, there will be a lot more eyes on 2018 power forward Shareef O'Neal than there were a year ago as a freshman. During a productive summer on the AAU circuit for Cal Supreme, the 6-foot-8, 190-pound son of future Hall of Famer Shaquille O'Neal picked up five a scholarship offers and is now trying to take his game to the next level. "My game is coming along," O'Neal said. "I'm playing hard and practicing every day. I just try and do what I do. I'm not just trying to score; I want to play all around with rebounding, passing and defense." Shareef hopes to use a successful sophomore season to catapult his stock nationally. "I'm looking forward to having a good year and being one of the top players in my class," O'Neal said. "If I do what I did during the summer then everything will fall in place." O'Neal is a four man who can score inside and out. He's got good size at 6-foot-8, a nice frame with long arms, can face up and shoot, is a good athlete and is improving on the block. He's strength and continuing to develop his skill set away from being able to take his game to the next level. Shareef O'Neal, who is the son of NBA great Shaquille O'Neal, emerged as a freshman at Windward. Following his freshman season, O'Neal had a strong showing at the Nike Elite 100. At 6-8, O'Neal has a 6-10 wingspan. He's mobile, active and a good athlete. O'Neal has good hands and touch and is a confident shooter from mid-range. The next steps in his development are strength and developing his post moves. The versatile 2018 power forward broke down what he knows and likes about the schools which have offered him. "I have offers from Baylor, LSU, UCLA, USC and Kansas State," O'Neal said. Baylor: "I like how they play. I haven't visited them but after I got my offer I did some research and I like how they play." LSU: "I'm going on a visit there this year with my dad. I talked to him about it and he said that I don't have to follow his footsteps and go to LSU if I don't want to." UCLA: "I like UCLA. I went on a visit there and the coaching staff is really nice. I like how they play and I like their location." USC: "I visited there too and the campus is awesome, the basketball team is awesome and the coaches are awesome too." Kansas State: "I haven't visited them or done enough research but I'm looking forward to doing that." O'Neal is hoping to hear from some other programs as well. "I like Arizona but I haven't been offered by them. I just recently got a letter from them though," he said. "I'd like to hear from Arizona, Duke, Kentucky and all the top schools." As of now, O'Neal is in no rush to make a decision. "I'm probably not making my decision until my senior year," he said. "I need to find the school that's best for me." Only a sophomore in high school, but I had no idea Shaq had a son that could hoop. I’m surprised you didn’t know Shake. As much as he comes across as goofy Shaq has his head on straight and is pretty smart. He would be a good mentor for a kid that's learning to play (physical ability aside). I would assume that his kids skills are well ahead of the standard learning curve for AAU players. Not that I've seen anything other than highlights.